Those of you who knew it all along can pat yourselves on the back: Blizzard‘s newest game is Diablo 3, announced mere seconds ago at the Worldwide Invitational! 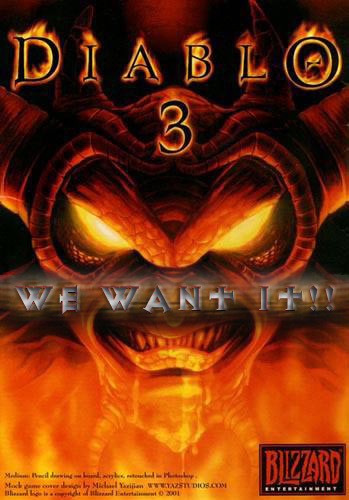 The Diablo III release date is not known! This entry was posted on Saturday, June 28th, 2008 at 7:50 am	and is filed under Amazing, Interesting. You can follow any responses to this entry through the RSS 2.0 feed. You can leave a response, or trackback from your own site. just saw the new video on the blizzard site video, looks really fun. They tend to be long in releases, tweaking them just right. The funny thing is by the time they release they are at least 2 years behind in technology (look at world of warcraft) but they still sell a billion of them! Full gameplay trailer for Diablo 3 trailer is just to die for. Check out http://wiki.diabloiii.ca for the latest information about Diablo 3, they have a nice compilation from blizzard forum posts too.